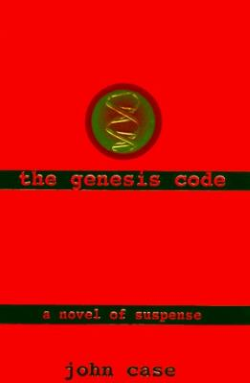 The Genesis Code is a 1997 Conspiracy Thriller written by husband and wife team Jim and Carolyn Hougan (under the pen name "John Case"). After Father Giulio Azetti, a priest in the remote Italian village of Montecastello, hears a shocking confession from the elderly Dr. Ignazio Baresi he rushes to the Vatican to inform the Church leadership. The secret of the confession was meant to only be shared with Cardinal Orsini, the head of the Congregation for the Doctrine of the Faith, but is overheard by the Cardinal's temporary secretary Father Donato Maggio, a member of the right-wing reactionary Catholic group Umbra Domini ("The Shadow of the Lord"). While the Church officially decides to put the matter of Baresi's confession on hold, Maggio passes on the news to the leader of Umbra Domini, Father Silvio della Torre, who states that "there is only one thing that can be done". In a wealthy suburb of Washington, D.C. a house suddenly explodes in flames, throwing a man violently into the grass and killing Kathy Lassitter and her young son Brandon who lived inside. Kathy's brother, private investigator Joe Lassiter, works to uncover the identity of the "John Doe" found outside his sister's house (now recovering in hospital) as well as the reason Kathy and her son were killed. Truong: "Oh, Cho. Very sorry. So very sorry." Foreshadowing: One of the officer's supervising Grimaldi's transfer from the hospital remarks on the attractiveness of the nurse but remembers hearing the other nurses say she was "some kind of religious nut"
Info Dump: Everything from the bureaucracy of the Catholic Church to fertility procedures. Justified in that the bodies needed to be thoroughly burned to ash in order to remove any genetic material that could be extracted. The Mole: Umbra Domini has several. Father Maggio, Cardinal Orsini's secretary. Private Investigator: Joe Lassiter and his company, Lassiter Associates. Would Hurt a Child: Umbra Domini has 17 of the children born from Baresi's procedure (and their mothers) murdered, and they almost kill the 18th.